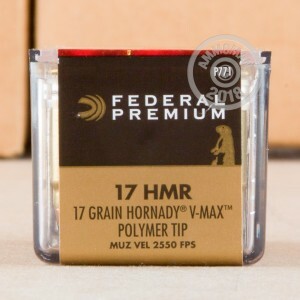 Varmint extermination has never been easier thanks to this .17 HMR ammo from Federal. 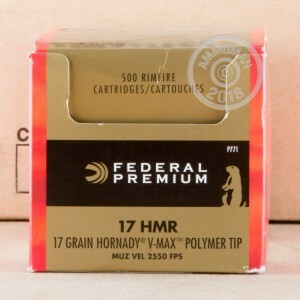 These cartridges feature Hornady V-MAX polymer-tipped bullets, which are designed to fragment rapidly for easy kills against squirrels, groundhogs, coyotes, and other pests. 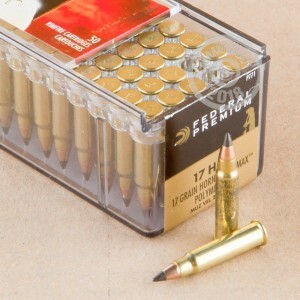 Each cartridge in this 50-round box fires a lightweight, 17-grain V-MAX hollow point at 2,530 feet per second. This high velocity causes the bullet to dependably break apart resulting in rapid fragmentation and maximum lethality. This ammo is loaded in Anoka, Minnesota, the longtime home of Federal Premium Ammunition. Hornady bullets are made in Grand Island, Nebraska.